Beholder is a 2D “spy-on-your-tenants” simulator where you must look out for breaks in the rules that are set by a corrupt government. The main protagonist, Carl Steiner is put in charge after the previous landlord was beaten and taken away. You must spy on the people that live in your building by installing cameras, and make sure they do not break the “laws” set out by the government, these are very small details that give off a Papers Please vibe such as owning types of books or owning an apple. 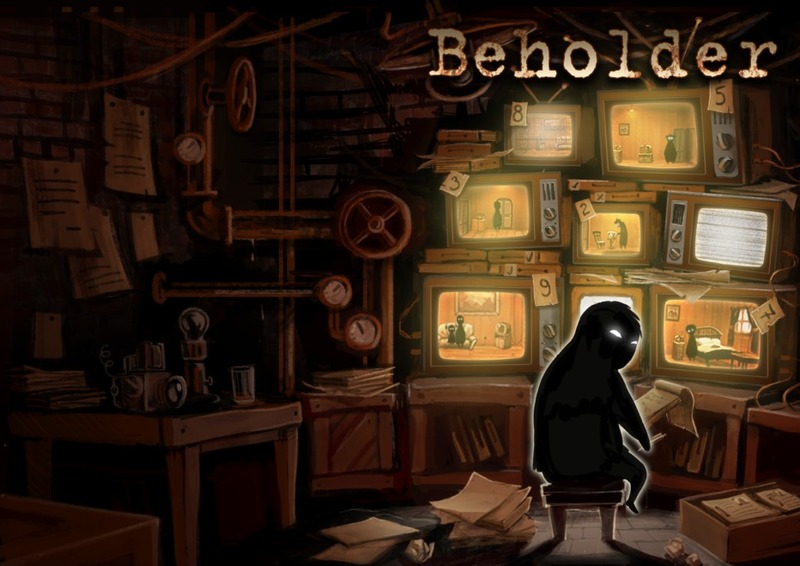 The graphics, yet nice, have a dark grungy look that really compliments the thematic setting of Beholder. The music and sounds that are in the background also compliment the eerie and morbid tones. The rain sounds lovely. You need not worry about missing something overnight as the opening cut scene explains how you have been injected with a drug that suppresses the need to sleep so you can spend more time monitoring the tenants. You are led to believe that they can live in their private life to their content but that is not the case. you have full access to their apartments and can also purchase CCTV to place in their rooms. The initial stages are a bit complicated as you need to keep an eye on the “laws” and whether or not the tenants are home, but the tutorial that you are thrown into does help and I recommended you do not skip it. Your actual task is to follow your duties, you are supposed to document everything in your “journal”, literally everything. You need to file reports of any illegal activities in the apartment, including who did what and when. You must create a profile on each tenant by practically looting their apartment and taking note of what they own and report it to the ministry. And pick up the phone when they need you, otherwise penalties will occur. The first mission occurs as follows: The ministry want you to collect information on the gentleman living in Apartment 2. Whilst he’s out, you go into his apartment, snoop through all his belongings, install CCTV and ask all the tenants about him. Evidently he’s not the nicest of blokes, but we do find some interesting information about him, which we file in a report to the ministry. They want him gone, so ask us to catch him doing something illegal and file another report when we’ve caught him in the act. It isn’t too long before that happens and we report him. The police then beat down his door and give him a beating, before chucking him in a van. Overall, the game is nicely paced yet still quite fast enough to keep you on your toes. The endless decision making and paths you can choose are very overwhelming yet impressive and it is very gripping. The dark side though is that you feel as a protagonist you will be able to turn the place around and make life better for the tenants and your family, but as the game goes on you know that you have to do your job which is the worst part. You become a slave for the government.